Longzhu beat SKT and KT Rolster defeated Samsung. When the KeSPA Cup semifinals kicked off on Dec. 1, the biggest story was jungler Han “Peanut” Wang-ho facing his old team, SK Telecom T1. A year of Peanut playing and learning with defending champs SKT ended in a heartbreaking defeat to Samsung Galaxy in the Worlds final. Afterwards, both the team and the player needed a fresh start. For Peanut, that meant joining old teammates Kim “PraY” Jong-in and Kang “GorillA” Beom-hyeon on Longzhu Gaming. 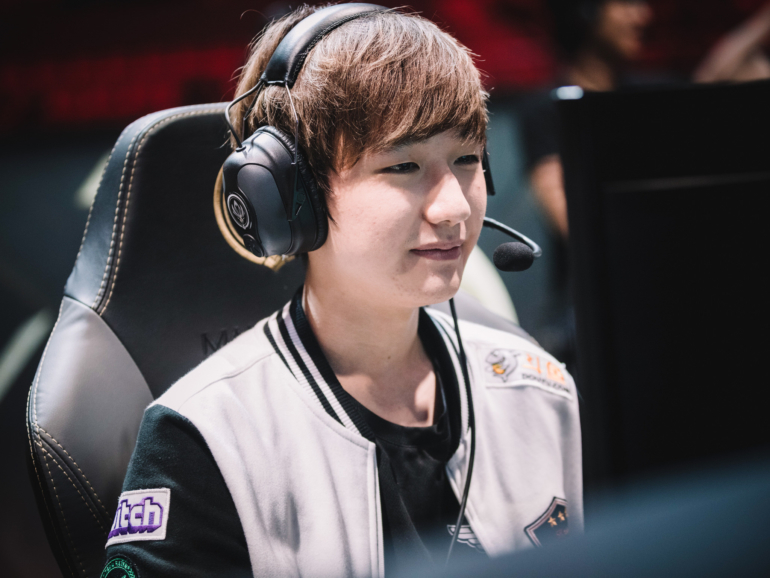 Peanut said in an interview with Inven that his departure from SKT was amicable. But he may have had extra motivation to beat SKT and prove that he is still a top-tier jungler. Consider that accomplished—Peanut dominated as Longzhu stormed to victory. The first game was figuratively over at 12 minutes when they picked up an ace on the bottom side of the map. Peanut hit ult after ult on Sejuani and was a nightmare to play against. After the loss, SKT, who had been playing with substitute support Lee “Effort” Sang-ho for the majority of the tournament, brought back starter Lee “Wolf” Jae-wan to stabilize things. Wolf helped SKT’s duo lane last a bit longer, but a four-person roam at nine minutes by Longzhu still resulted in his death. SKT’s inability to generate pressure on the bottom side of the map, even with favorable matchups, has long been a weakness, even more so than the issues in top lane and jungle. SKT stabilized a bit after that, but a cheeky Baron sneak by Peanut sealed the deal. In the final, Longzhu will meet KT Rolster, who defeated Samsung 2-1 in the earlier match. KT used relentless top lane pressure from Song “Smeb” Kyung-ho to overcome Samsung’s superior macro. Even as the new champs took objective after objective, KT stayed close via Smeb’s lane. His Gnar in the first game was impeccable and his trademark Kennen in the deciding third game was everything Smeb fans have come to expect from that champion. A huge flank ult from him ended the game. KT still have issues, especially when it comes to forcing objectives, but they are still the best at picking people off. It’s important not to read too much into these results. The KeSPA Cup has long been used by top LCK teams as merely a tune-up. That explains some of the player substitution patterns and champion picks. SKT star Lee “Faker” Sang-hyeok has rarely played Malzahar on stage and ADC Miss Fortune has not been meta for ages. These are players still learning what the meta is and figuring out how to play with each other. But there are things we can learn. Lots of teams are trying poke-heavy compositions to take advantage of new runes. But collapsing around the jungler is a good way to defeat those lineups. That’s why Miss Fortune and Azir have come back to the meta. It also appears that KT have improved over the form we saw for most of 2017. In reality, the team was starting to get things together at the end of the Summer Split, when they took down Longzhu and took a 2-0 lead against SKT. Longzhu too showed no issues integrating Peanut. These are still the best teams in the LCK, and it looks like they’re getting better. That LCK teams are improving bodes ill for the rest of the world. Korea’s stranglehold on League means the next World Championship will likely run through these four teams.